A young girl had to leave Maine for mental health care. It’s been 6 months. A 15-year-old Maine girl is pictured in Illinois where she's lived since November to receive mental health care. The Bangor Daily News is not identifying her to protect her privacy. Lora’s 15-year-old daughter is pleading to come home to Washington County by the time she turns 16. The girl, who struggles with developmental delays, behavioral problems and aggression, is living at a youth home 1,500 miles way in Carbondale, Illinois. She’s been there since November. Before that, she spent about four months at a youth home and psychiatric hospital in Vermont. She first left home in June of 2016, going on to face “countless” placements at residential facilities and crisis units in Maine over the next two years. Not a single facility in the state is willing to accept her, Lora said. To protect her daughter’s privacy, Lora asked that the girl’s name not be published and that she be identified by only her first name. 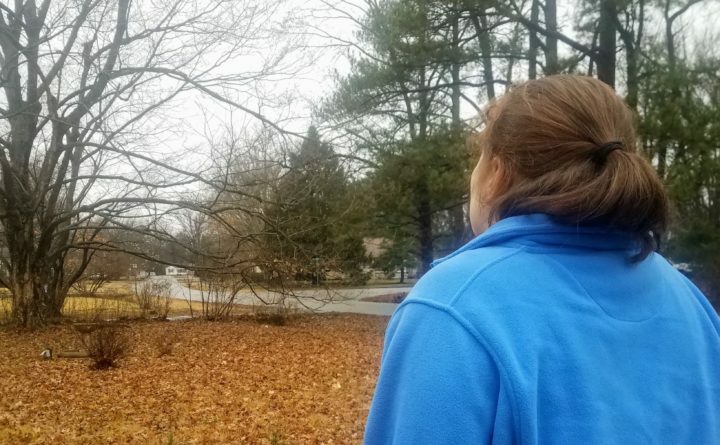 Lora’s daughter is among an increasing number of children with mental health and behavioral needs that Maine is sending to facilities out of state. In fiscal year 2018, 87 children were placed in residential facilities and hospitals outside Maine, up from 70 the prior year and 46 in fiscal year 2016, according to a review of the state’s services for that population released last week. Maine is sending an increasing number of children with mental and behavioral health needs out of state for residential treatment. While most of those placements were within New England, some children moved as far away as Arkansas, Missouri and Utah, the report found. The reasons are many. Some children require special treatment unavailable in Maine, such as residential care for eating disorders. Others, like Lora’s daughter, have behaviors or symptoms that local providers feel unequipped to manage, the report states. Sometimes no placements are available at a given time, because beds are already full or Maine lacks the type of facility required. But rather than respond by building more institutions to house children with behavioral and mental health needs, the Maine Department of Health and Human Services must intervene in their lives sooner, with services delivered in homes and communities, said Katrina Ringrose of Disability Rights Maine, which advocates for children and adults with disabilities. Maine’s existing system for treating individuals in crisis is geared toward adults, she said. When kids’ unaddressed mental health challenges escalate into a crisis, many parents have no choice but to bring their son or daughter to the emergency room. After walking through the hospital doors, the chances that the child will need a higher level of care, such as a residential placement, shoot up, Ringrose said. 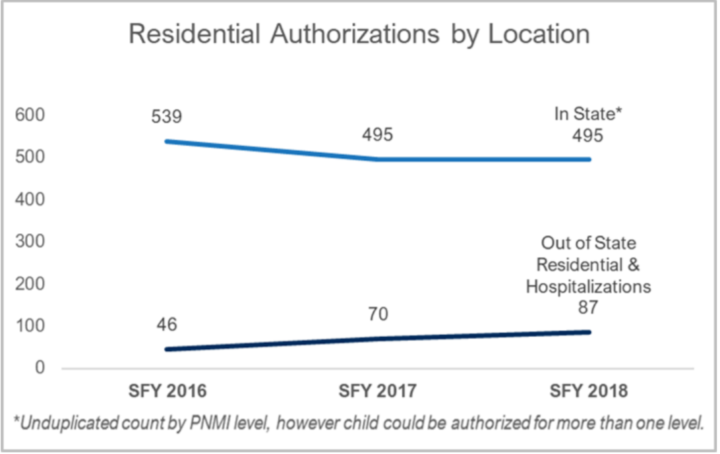 Once a child is in the system, providers are inclined to refer them for that care, and some children’s conditions tend to worsen in a hospital setting. Maine is also sending more children out of state to psychiatric hospitals and for longer durations, the report found. Maine already has more than 100 psychiatric beds for children between four hospitals and roughly 300 beds at residential care facilities, Ringrose said. She “can’t imagine a situation where Maine needs more beds,” she said. Institutionalizing children not only costs much more in the long term than providing less intensive care, but evidence also shows it’s “not what’s best for kids,” she said. Many children are waiting months for services delivered in their homes and communities, despite federal law limiting waits to 180 days. And even though some residential facilities have open beds, kids still are left waiting because the facilities can’t hire enough workers to staff the beds, the report noted. Salaries in the often stressful and dangerous field are low, discouraging new applicants and leading to burnout among the existing workforce. By providing the right services early on — such as day programs at local agencies or aides visiting children’s homes regularly — Maine could limit the number of children in crisis who need institutional care, she said. Some children now in residential care could go home if those services were funded and available, Ringrose said. But if Maine builds more psychiatric facilities — as former Gov. Paul LePage aimed to do through a now-stalled project in Bangor — “then they’re going to be filled, and there’s a financial incentive to fill them,” she said. While some children receiving behavioral and mental health services are covered by private insurance, the vast majority rely on MaineCare, the state’s Medicaid program. Every time the state places a child in residential care out of state, it must pay room and board expenses, in addition to covering the actual treatment. 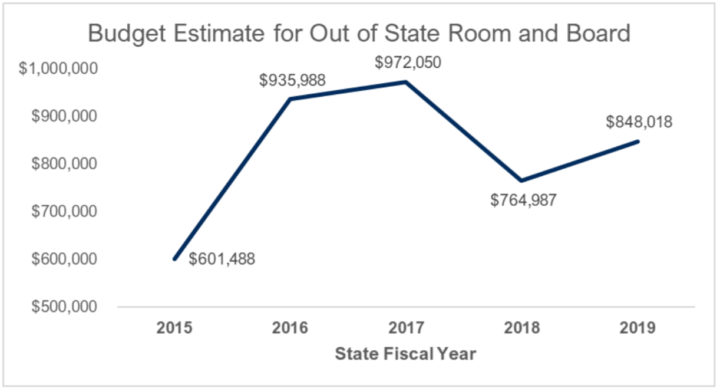 In fiscal year 2019, DHHS estimated it would spend $848,018 for room and board alone. That’s up from $756,00 in the previous fiscal year, though down from a recent high of $972,000 in 2017. Room and board cost estimates for children living at treatment facilities outside Maine. Ringrose said she’s hopeful that the new report, the first review of Maine’s system for children with behavioral and mental health needs in two decades, will spur change under newly elected Gov. Janet Mills. Produced by the Boston-based Public Consulting Group, the report resulted from her organization’s negotiations with DHHS, in lieu of a lawsuit against the department over its failure to ensure children have timely access to mental health care. “We’re hoping this report can be used as a blueprint for the new administration to work with all stakeholders to develop a strategic plan and move Maine forward to ensure that kids and families are receiving timely access to all services and that we have a full continuum of care,” Ringrose said. Change could also come in the form of new legislation. Rep. Lori Gramlich, D-Old Orchard Beach, plans to propose a bill that would limit the number of Maine children housed at residential treatment facilities outside the state. “We’re calling it ‘Bring the kids back home,’” she said of the bill. Aside from such medical designations, Lora said it’s wrenching for her daughter to be separated from those who love and support her. For now, she can only hope that her daughter will learn to manage her aggression and impulse control well enough to come home soon. The girl, who once enjoyed swim team and attending her mother’s choral performances, could still live a relatively normal life if things turn around, Lora said. But she has no idea what the next weeks and months will bring.